Deputy Sheriffs have the same Law Enforcement authority as the Police Department. Since the Sheriff is elected by the citizenry, only Deputy Sheriffs have the authority to enforce Civil Law in addition to Criminal and Traffic Law. The Baltimore City Sheriff’s Office shall constitutionally enforce both criminal and civil law. Through strength, courage, knowledge and dedication, we will keep our Circuit Court safe and free from threats and violence. We shall work relentlessly to bring to justice those who violate the law and inflict violence on others. 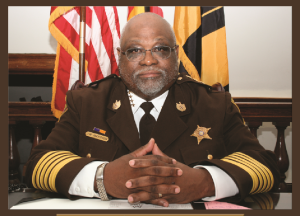 In the spirit of service, and in keeping with our oath as Law Enforcement Officers, we will, without partiality or prejudice, treat people with fairness, equality, dignity and respect while remaining courteous at all times, consistent with maintaining the people’s trust in a democratic society, all the while furthering the public safety mission of Baltimore City and the State of Maryland. Service of Writs of Execution, Summonses, Subpoenas, and Writs of Possession. Collection of Fines and Court Costs. Transportation of prisoners to place of incarceration. Maintaining order in the Circuit Court courtrooms. Custodial charge of prisoner during trial. Custodial charge of jurors during sequestration, including transportation to and from overnight accommodations.